The global reusable plastic water bottles market is likely to exhibit rapid growth in the coming years on the back of growing demand for reusable products in the plastics space due to growing realization of the adverse environmental consequences of large-scale and unchecked use of plastic. The reusable plastic water bottles market has grown steadily across the world in the last few years due to growing support for environmental conservation movements and is likely to remain a key revenue earner in the coming years. Asia Pacific except Japan is likely to dominate proceedings of the global reusable plastic water bottles market, with the growing economies in the region providing the reusable plastic water bottles market fertile ground for smooth growth. By material type, high density polyethylene is likely to remain the dominant segment in the global reusable plastic water bottles market over the 2017-2022 forecast period. 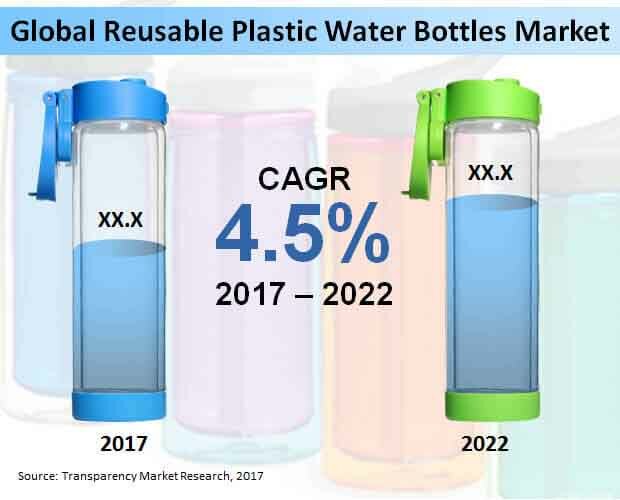 According to Transparency Market Research, the global reusable plastic water bottles market is likely to exhibit a robust 4.5% CAGR over the 2017-2022 forecast period. Valuation of the reusable plastic water bottles market is likely to rise to US$3.2 bn by the end of 2017, with the market expected to be valued at more than US$4 bn by the end of 2022. Growing awareness about the environmental damage caused by large-scale use of plastic is likely to remain a key driver for the global reusable plastic water bottles market. Growing amount of scientific data has demonstrated the clear risk of increasing the use of plastics at the current rates, with plastic being pointed out as a key pollutant in any ecosystem. Being nonbiodegradable, plastics cause havoc with any ecosystem in which they are dumped, including terrestrial and marine ecosystems. As a result, a growing number of governments now support the innovation of reusable plastic products, which reduce the burden caused by the need to degrade them. Rising demand for bottled water in Asia Pacific except Japan is likely to be a major driver for the global reusable plastic water bottles market over the 2017-2022 forecast period. Due to rampant urbanization, economies in Asia Pacific except Japan have become important consumers of bottled water, making them likely to be vital regional markets for global reusable plastic water bottles market players in the coming years. Countries such as China are leading producers of plastic water bottles, making growth of the reusable plastic water bottles market easier in the Asia Pacific except Japan region. The Asia Pacific reusable plastic water bottles market is expected to exhibit a robust 5.6% CAGR over the 2017-2022 forecast period, with the market expected to account for 34.7% of the global reusable plastic water bottles market by the end of 2022. The Asia Pacific except Japan market for reusable plastic water bottles is likely to gain 195 BPS over the 2017-2022 forecast period, cementing its position as the leading regional contributor to the global reusable plastic water bottles market. Leading companies in the global reusable plastic water bottles market include Vista Outdoor Inc., Thermo Fisher Scientific Inc., BRITA GmbH, Tupperware Brands Corporation, Taiyo Nippon Sanso Corporation, ZheJiang Haers Vacuum Containers Co. Ltd., A. O. Smith Corporation, Implus LLC, Cascade Designs Inc., and Elite S.r.l.